Here you will find our programs. Enjoy all of the software's features downloaded distributives. Enjoy interface, get information about how to register our software, how to get technical support and more. PC Magazine/RE BEST SOFT 2006!!! Program Phone Book became a winner triple and got logo "Yes, It Works" from test lab of PC Magazine/RE in frames of conducted by Microsoft company program named Microsoft Office Extensions. Phone Book has powerful search system (quick search on main fields and advanced search on any field); it gives opportunities to: sort information, print out, dial up phone number directly from application (in case of presence of modem), travel Internet links, start e-mail client, start ICQ, export data to in Excel or HTML, export and import data for transfer from one computer to other, create (manually and automatic) backup copy and restore data from backup, protect the information with password. Features: Simplicity and comfort in use, high reliability, protection information with password, powerful and comfortable search system, automatic backup and restoring of data, styled and comfortable interface, dial up of phone number, export in Excel and HTML. Power Phone Book is an organizer of new generation. It has all standard functions as modern organizer, additionally allows to user, to set up data access thru Internet, all over the world, providing high level of security. Server Firebird, which used in this solution as database engine is a modern entity of Interbase SQL Server. Personal Edition - for use in small and middle firms and for personal use. Power Phone Book is simple in administration; local single-user version does not need any administration, because all needed settings perform by program itself. Multi-user mode needs only couple of parameters on client computer. MagicScore is a magnificent, powerful and convenient musical editor, for those who professionally are engaged in music, seriously studies it or simply loves music and self-expression.. The convenient interface for a set of musical score, some variants of data input by means of the virtual keyboard, external MIDI devices and big set of musical symbols. 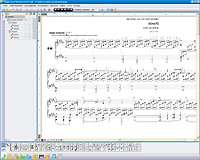 Automatic and manual formatting of the musical score. Reproduction and printing of the musical score. Saving in format MIDI. Reading from format MIDI. Support of editing operations, copying and removal of a set of the allocated elements of the musical score. A wide choice of elements of registration. An opportunity of adjustment of force of impact of each note at sound reproduction. The extended opportunities of navigation. 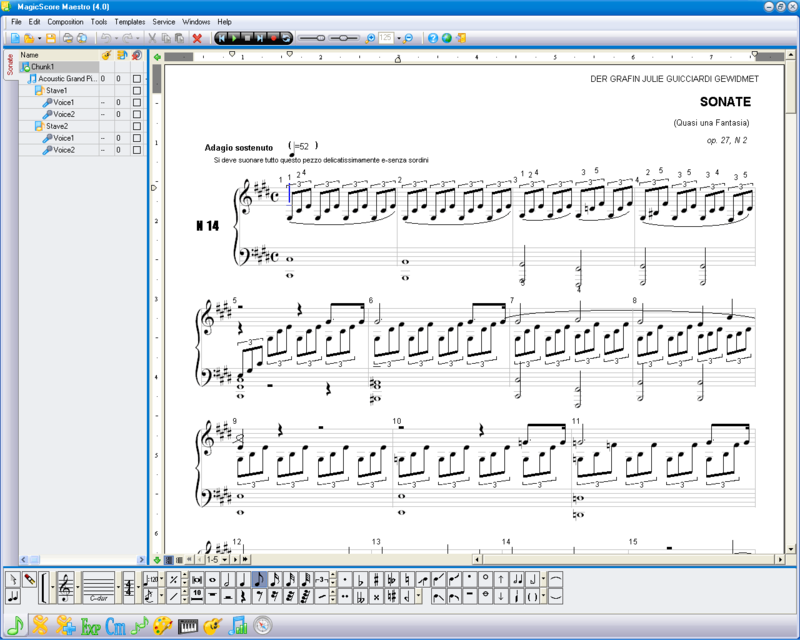 MagicScore Maestro - the music notation software! MagicScore Maestro is a magnificent musical editor. This music natation software allows creating compositions of any complexity, including polyphonic ones. Virtual piano, guitar tones, partita entry from a MIDI-device, ability to work with chords, extensive opportunities for editing and fine adjustment of sound of your composition. All of the above and many other functions of MagicScore Maestro will assist you in your creative work. The program will compute the playback of effects for you (Arpeggio, Gruppetto, Vorchlag, Trillare). Having experienced the wonderful abilities of MagicScore Maestro, you will receive a great pleasure from using it. You will see the wide opportunities of partita editing. You will feel the ease of creating your compositions. You will be able to adjust the sound of each note and of the entire composition precisely, according to your wishes. You will realize the benefits that this program entitles you with. This music natation will help you prepare yourself for concerts and performances. With its help, you can be self-assured in the most responsible moments. With assistance of MagicScore Maestro, you can create magnificent compositions, and you can have that done in the best possible manner.